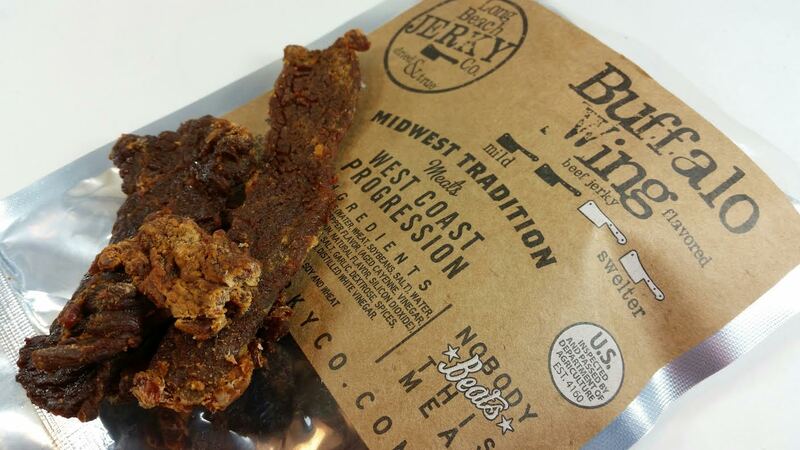 Long Beach Jerky Co. in Buffalo Wing- I think this beef jerky had the most interesting texture. It wasn't moist and chewy but it wasn't something I had to gnaw at either. It sort of broke into bits in my mouth. It wasn't bad at all, just different. 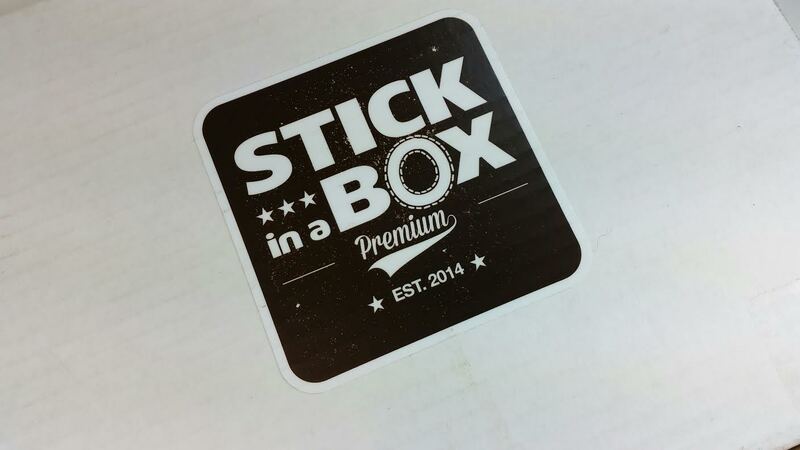 Especially compared to the other jerky brands in this box. I didn't really like the Buffalo Wing flavor (too vinegary) but DH happily ate it all. Long Beach Jerky Co. in Gramps' Original- This (obviously) is the same brand as the Buffalo Wing flavor but I much preferred the Gramps' Original. In fact I think this was the best tasting jerky in the box. It has the same texture as the Buffalo Wing which made it kind of a dry chew but definitely flavorful and delicious. I don't know what cut of beef they use but it does have a lot of fat marbled throughout. King Kalibur Original Black Angus Beef Stick- I'm not a superfan of sticks but DH is an equal opportunity eater so he ate these while sitting at the computer. He started with this one because "it was the fattest and had the most annoying wrapper." Which, yes, there is much more wrapper than necessary but I wouldn't hold it against the stick! He said this was "Alright" and since he ate it before I got a taste and he won't tell me what that actually means, that's what you're stuck with. Dusty's Bacon Flavored Snack Stick and Habanero Snack Stick- Two sticks of the same brand but very, very different flavors. Bacon, of course, being everyone's favorite flavor and Habanero being my husbands happy place. He loves spicy. This stick was not spicy enough for him but this is the guy who likes to spread Ghost Chili dust over all his food (I got a Smoked Ghost Pepper Chili grinder at Trader Joes- it grinds flakes into a very fine powder over your food). The Bacon flavored one fared better and he said he liked it enough to eat another one. 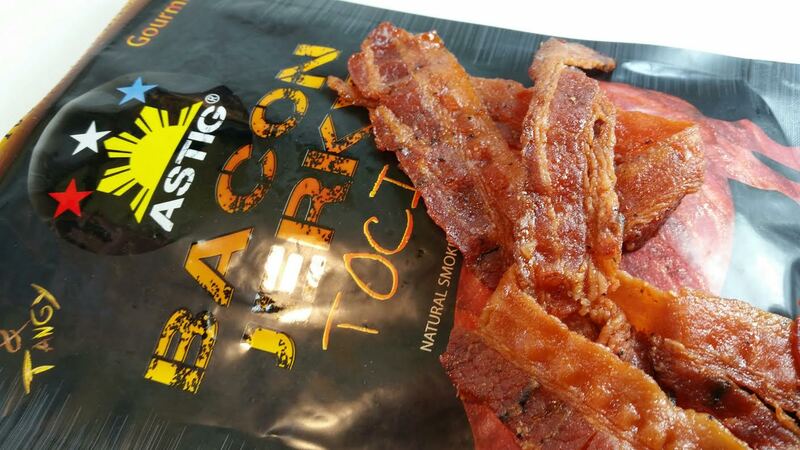 Astig Bacon Jerky in Tocino- Speaking of bacon! We got bacon jerky this month! I've noticed this is becoming more popular. I saw some at the store the other day but it was Oberto brand. 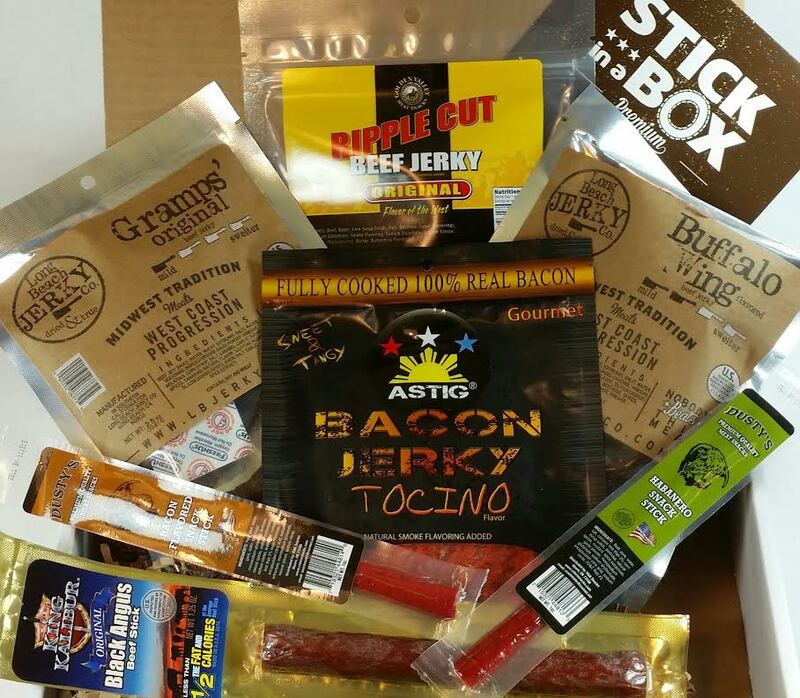 We got a bacon jerky in the November box and it was delicious. This is a different brand, though. Here's what's in it: Brown Sugar, Pineapple Juice, Hot & Spicy Banana Ketchup , Lemon-Lime Soda, Soy Sauce (water, wheat, soybeans, salt), Salt, Garlic, Pepper, Cayenne. This jerky bacon was very good! It's a little sticky, though. The other Astig jerky we have tried had the same problem. It's very good but not something you should be eating while typing. 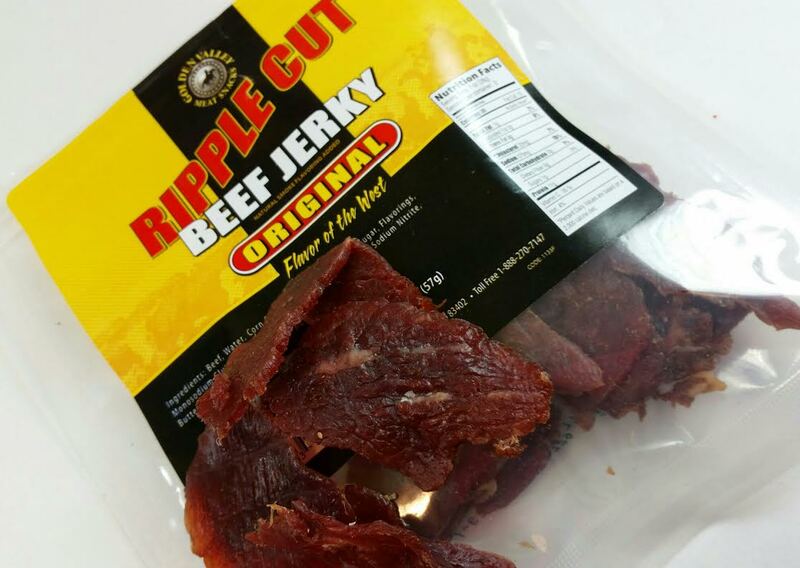 Golden Valley Meat Snacks Ripple Cut Beef Jerky in Original-With a name like Ripple Cut, I was expecting it to look something like those wavy potato chips but it looks like regular beef jerky to me. This actually was my least favorite jerky. Especially compare to the others, it had very little flavor beyond a peppery heat of aftertaste. I found it difficult to chew even though it's fairly thin. 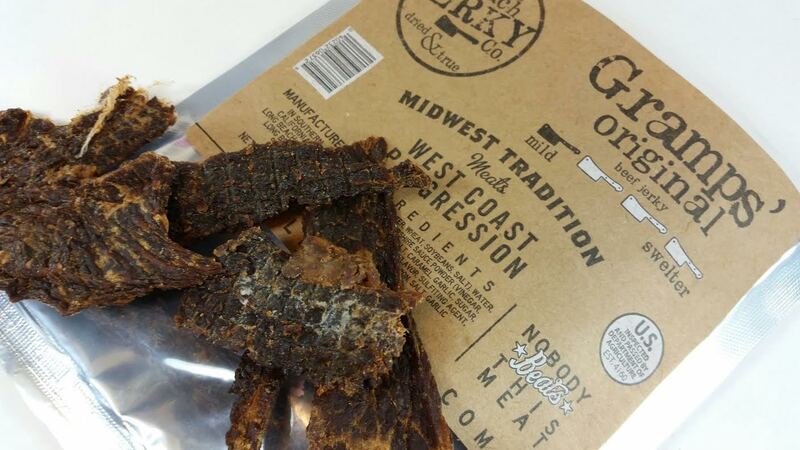 VERDICT: My favorite part of this Stick in a Box was the Long Beach jerky in Gramps Original. I just loved the taste and it was easy to eat. I have really liked getting four bags of jerky the last few months. 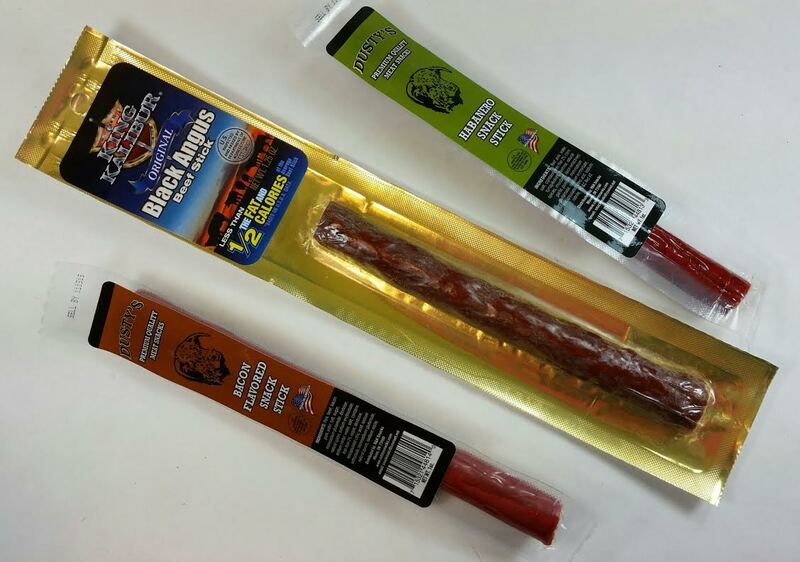 I prefer jerky over beef sticks but I know variety is the spice of life and my husband eats them happily. I've actually been having a lot of fun with this subscription! It has really broadened my beef jerky horizons. At $35/month, it's not cheap but we absolutely love getting it. We've had so many jerkies we never would have found otherwise. Several of them aren't available this side of the Mississippi and a few only sell wholesale so there's no way to get them online. There has been, obviously, jerkies we liked better than others but no jerkies that were so awful we couldn't eat them. It is jerky, after all. Meat is delicious!